The following is a report by Lily Hughes on her recent Madrid trip to participate in the World Congress Against the Death Penalty. Over the last few days the Campaign to End the Death Penalty has been represented at the 5th Annual World Congress Against the Death Penalty in Madrid, Spain. Myself and CEDP board member Delia Perez Meyer (sister of TX death row prisoner Louis Castro Perez) arrived in Madrid on the morning of June 12th and attended the opening ceremonies for the the Congress that very evening! The conference opened with various government officials from all over the world speaking. Lots of politicians attended the whole conference, which was a unique experience for us! Throughout the week we have met some incredible individuals and organizations in the fight against abolition worldwide. There were former death row prisoners from around the world at the conference. We spent a lot of time with two of them: Kirk Bloodsworth from Witness to Innocence, a former death row prisoner from the U.S., and Edward Edmary Mpagi, a former death row prisoner from Uganda who was freed after it was proven that the person he was supposed to have murdered was alive! Edward worked with the African Journey of Hope in 2011. We also met Tanya Ibar, the wife of Pablo Ibar, a Spanish national who has been on Florida’s death row since 1994 . Pablo Ibar’s co-defendant was already released based on evidence of innocence which should have applied to both men. The folks from the Collectif Unitaire National de soutiens a Mumia Abu-Jamal were so helpful to us throughout the weekend, letting us put our materials at their table and showing us the ropes at the conference. We had a great time hanging out with Will Francome, whose story was the basis for the movie In Prison My Whole Life focusing on Mumia. His new project is called One for Ten and is a series of ten short films about former death row prisoners that focuses on the different ways innocent people are convicted. I attended a session where I saw three of these fantastic short films! Delia was so happy to connect with the Sant’ Edigio Community, a Catholic organization based in Rome that has supported death row prisoners around the world through penpal relationships. We also were able to meet several folks from the British organization Reprieve, that has been responsible for the brilliant campaign to persuade European drug companies to not sell their products for use in executions. There were many interesting panel discussions throughout the weekend. Delia’s highlights were a sessions called Victim’s Families: an international action network. Bill Pelke, a murder victim family member and the founder of Journey of Hope, spoke here about how the young woman who murdered his grandmother is being released from prison next week in Indiana, and about his relationship with her over the years, including writing letters and putting her through school – he is traveling straight from Madrid to Indiana to meet her upon her release. Her other favorite session was one on innocence and abolition – the meeting featured Alvaro Corcuera, a Spanish journalist and Kirk Bloodsworth from WTI, and focused on how to use innocence and judicial errors as an important part of abolition strategy, without penalizing defense attorneys. My favorite session of the whole conference focused on alternative sentencing. Several amazing speakers discussed the reasons abolitionists should oppose life without parole (LWOP) as an alternative the death penalty. One of the speakers represented Penal Reform International, a fantastic group working on penal and criminal justice reform worldwide. Constance de la Vega, a professor from San Francisco even quoted me at the end of her remarks, not knowing that I was in the room! I spoke during this session about the CEDP’s stance against promoting LWOP as a just alternative to the death penalty and my comments were very well received. In general there were very few U.S. groups represented at the conference. The U.S. roundtable discussion featured Richard Dieter from the Death Penalty Information Center and Elizabeth Zitrin from Death Penalty Focus. There was a lot of good information presented here about the state of the death penalty in America today, but I felt that only one strategy for changing public opinion was discussed from the floor – the more conservative strategy focusing on cost, promoting LWOP and partnering with law enforcement that was employed most recently in California. I also spoke from the floor here and raised some debates, including a point about the huge impact the movements around individual cases like Troy Davis and Stan Tookie Williams have had on how people think about the death penalty. The CEDP was able to participate in the conference in a few formal ways. We submitted a poster to display during an informal “poster session” which Delia had created. The poster featured Delia’s brother Louis and focused on our strategy of working on individual cases. Our poster was displayed alongside several others and we stood around it and discussed it with the different folks that came by. I was called upon to help translate the final statement of the Congress into English from French – kind of a fun job! On the final day of the Congress, today, there was a huge march against the death penalty through the streets of Madrid. It was truly incredible to march alongside people from all over the world and hear chants in all different languages. We carried a big banner like picture of Louis during the march and had our picture taken a lot! Delia was interviewed by journalists from all over throughout the weekend and at the march. We’ll be posting pictures on our Facebook page very soon. 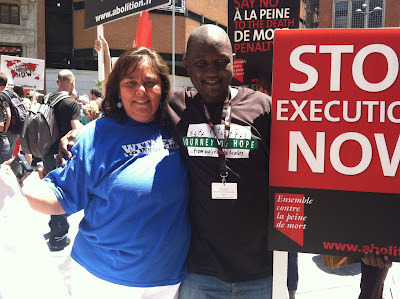 We are so grateful to the World Coalition to Abolish the Death Penalty (WCADP) and the French abolition group Together Against the Death Penalty (ECPM) for making this trip possible. We have had an amazing four days and met so many incredible people. It has truly been an unforgettable experience!